Description LRRK2-IN-1 is a potent and selective inhibitor of leucine-rich repeat kinase 2 (LRRK2) with IC50 values of 13 nM and 6 nM for wild-type LRRK2 and G2019S mutant LRRK2, respectively. LRRK2 (Leucine-rich repeat kinase 2) is also known dardarin. LRRK2 belongs to the leucine-rich repeat kinase family. LRRK2 mostly located in the cytoplasm, however, it also associates with outer membrane of the mitochondrial. LRRK2 interacts with parkin at the C-terminal R2 RING finger domain. Parkin interacted with LRRK2 at the COR domain. LRRK2 mutation will induce apoptotic cell death of neuroblastoma cells. Expression of LRRK2 mutants has a close relationship with autosomal dominant Parkinson's disease. The LRRK2 Gly2019Ser mutation is a common cause of familial Parkinson's disease. The Gly2019Ser mutation has been proved to cause Parkinson's disease, even though it is a small number of LRRK2 mutations. LRRK2 also has relationship with Crohn's disease by genomewide association studies. LRRK2-IN-1 dose-dependent inhibit the activity of wild-type and G2019S LRRK2 with IC50 of 0.17 and 0.04μM respectively in HEK293 cells stably expressing GFP tagged wild-type or mutated LRRK2. LRRK2-IN-1 inhibits the activity of both wild-type and G2019S mutant LRRK2 with IC 50 values of 13 nM and 6 nM respectively in vitro enzyme assay with 0.1 mM ATP. LRRK2-IN-1 competed with ATP. LRRK2-IN-1 has a selective profile compared with other 442 diverse kinases and it has no inhibition effect with LRRK1. 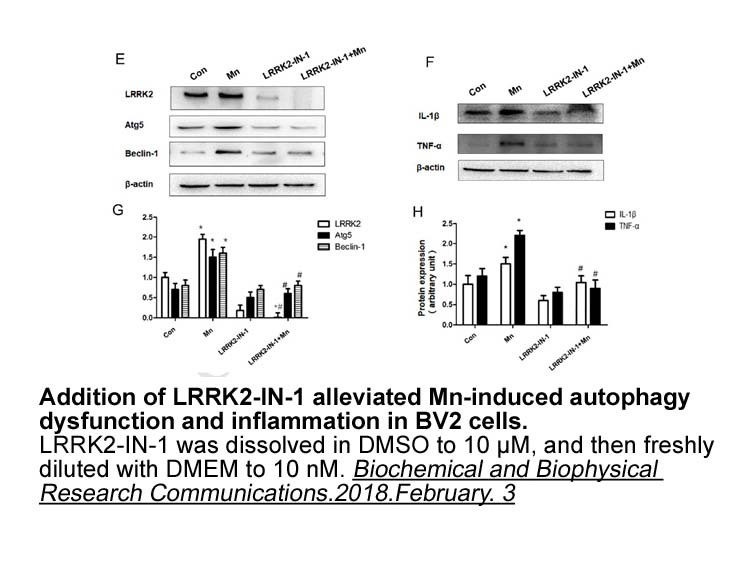 LRRK2-IN-1 induced endogenous LRRK2 phosphorylation in lymphoblastoid cells. LRRK2-IN-1 also induced Ser910/Ser935 dephosphorylation of LRRK2 in mice kidney at 100 mg/kg.
. Deng X, Dzamko N, Prescott A, Davies P, Liu Q, Yang Q, Lee JD, Patricelli MP, Nomanbhoy TK, Alessi DR et al: Characterization of a selective inhibitor of the Parkinson's disease kinase LRRK2. 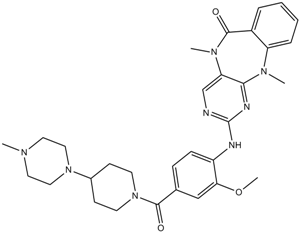 Nat Chem Biol, 7(4):203-205.
. Hermanson SB, Carlson CB, Riddle SM, Zhao J, Vogel KW, Nichols RJ, Bi K: Screening for novel LRRK2 inhibitors using a high-throughput TR-FRET cellular assay for LRRK2 Ser935 phosphorylation. PLoS One, 7(8):e43580.